If only words were enough. 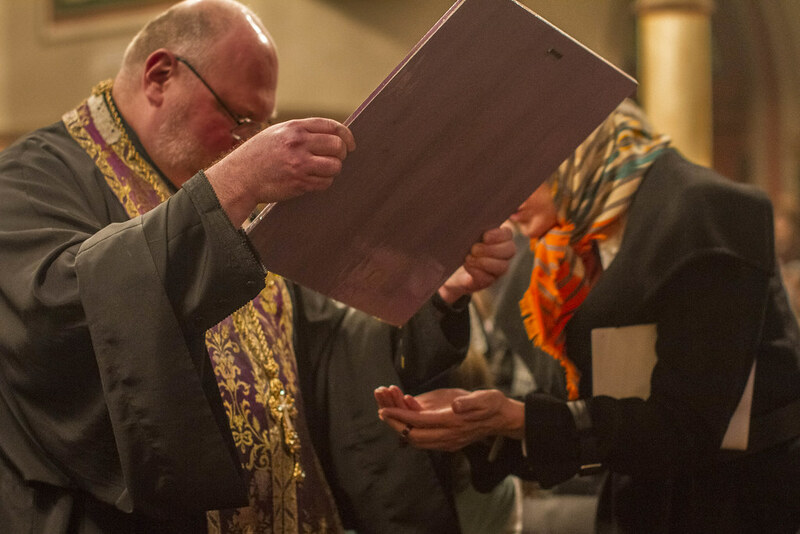 On March 24, 2017, St. Nicholas of Myra Orthodox Church received the Myrrh-Streaming Icon of the Mother of God, the Kardiotissa, from St. George's in Taylor, PA. A Moleben service to the Blessed Mother was celebrated in its presence, and afterward, Very Reverend Protopresbyter Mark Leasure, pastor in Taylor, PA and guardian of the Blessed Mother, shared stories with the gathered faithful of over 400. Many clergy from the immediate and distant area gathered as well to anoint the faithful with the precious Myrrh. Afterwards, a fellowship meal was provided in the main hall by faithful and the St. Nicholas Altar Society. Glory to God for all things! And to His Blessed Mother, the Theotokos, for her heavenly intercession and for blessings received! During the Moleben, Fr. Mark Leasure of St. George's in Taylor, PA walks with the Blessed Mother, streaming myrrh into the open hands of faithful.